Gimps Gold: Hitting my 1st Target and how I started! What where my top sellers this week to help me hit this mark? This is the reason I haven't posted for a couple of days. I kept coming close all week so I decided to knuckle down and hit my first target of 100k so I could stop worrying about it and get back to posting. So this weeks sales where mainly Gems, as my stockpile of Infernos was flying off the shelves, along with a continued high number of Netherweave bag sales, which although they do not turn a great profit, its an easy and simple market. So my top sellers this week where Bags, Dust and Infernos, now the gem market on my server hasn't got the highest price, but the numbers that sell are consistent. At the moment I work during prime time and therefore I am missing out on greater sales. Now step two is where I learnt my markets, so for my specific situation I have always been a fan of Jewlcrafting since it was released in The Burning Crusade. With this in mind I wrote out a plan on a note pad and followed it till I was happy posting within the market. Research these markets on Wowhead for Item details, Gold Blogs for sales Ideas, and Elitist Jerks style sites for High End PVE and PVP usage from within the chosen Profession. Now this last bullet point is where I really want to focus, "Watch the Market"! So for a week before I started investing largely, I checked the prices of both Materials and Crafted items periodically throughout the day. When possible this meant Morning, Lunch, Pre-raid times, Post-raid times. I posted a few gems here and there but mainly stuck to just observing for the first week. While watching the market I came to a few conclusions that I used to guide my posting in the future. I came to a Minimum and Ideal price for sales that was based upon my own observations as well as those of Addons such as Auctioneer, TradeSkillMaster and Auctionator. The secondary prices I concluded where the prices I was willing to pay for Raw Materials, this price wasn't based upon the market prices of materials, but rather on the sales prices I had already concluded and how much profit I was willing to take. So this is how I will move on to my second target of 250k. The difference is this time I'm gonna do it larger and more diverse. I have been watching multiple markets while I've been selling my Gems and other bits and bobs and I have gone from each and every Profession I have and I've picked items I'm confident in. With the power of Altoholic allowing me to keep track of all my bags and banks I have been stockpiling raw materials for multiple profession and multiple levels and organising them ready to move into more markets. That's it for today's post, I hope its been helpful to people who have hit a similar mark to me and cannot decide how to move forward. 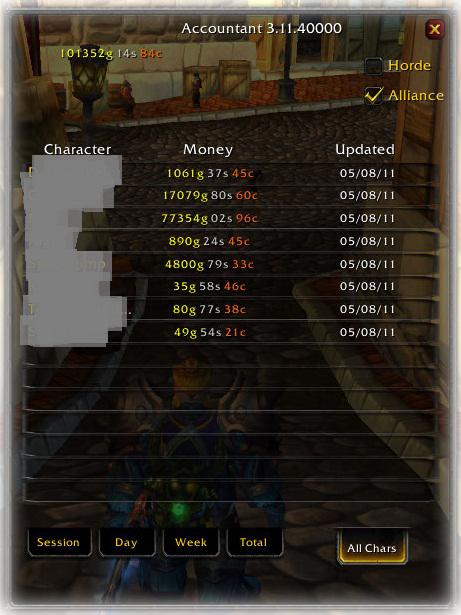 Remember one thing, Addons are great but they are nothing without knowledge, so make sure you understand your markets and prices based upon personal experience not just addons! Thanks for this post, I am just starting to think about how to make gold and it's a bit daunting to start with!